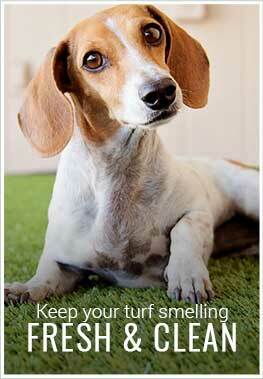 Description - Our K-9 Turf Rolls are the perfect turf option for any backyard, doggy daycare, and much more. This fake grass roll features a realistic look and feel, that is soft to the touch and easy to clean and maintain. With triple the number of perforations, you will never have to worry again about urine and other liquids pooling in your turf. As with any other type of turf, of our pet-friendly artificial grass is very safe, as no pesticides or fertilizers are needed and inhibits the spread of harmful ticks and fleas. A 15-year warranty backs our K-9 Turf Rolls. Weight – .557 Lbs. per square feet. Recommended Uses – Our K-9 Turf Rolls are great as both indoor and outdoor turf and have been used as flooring for backyards, playgrounds, doggy daycares, in dog parks, and much more. 3-Times the perforations for optimal drainage. The grass at our dog park was constantly looking terrible, especially after it rained and the dogs were running around on it. Adding the turf has proved to be an excellent choice as it continues to look nice! Highly recommend this for dog parks. We installed the K9 turf rolls at the Bark Park in our dog-friendly apartment complex and our furry residents seem to love it! They have more room to play and run around and the turf makes for easy cleanup. Great product! My pups are happy to finally have a green space outside!